Paikat täyttyvät nopeasti – platserna fylls snabbt! Pohjoismaisen neulesymposiumin paikat täyttyvät nopeasti. Jos olet ajatellut osallistua, ilmoittaudu lähipäivinä! Nordiska sticksymposiets platser fylls snabbt. Om du har tänkt delta bör du anmäla dig inom de närmaste dagarna! That was a wonderful ‘warm-up’ colour for me to see………..-21 C this AM! Thanks. Manipulated colour, I’m afraid. iPhone “Crome”… I thought the same, what a nice colour! The original is much more dull. Stitch: woven stitch, look at Scrappy Woven Scarf, Ravelry patterns. Nice way to use left overs. oh my……..who would have thought! thank you. 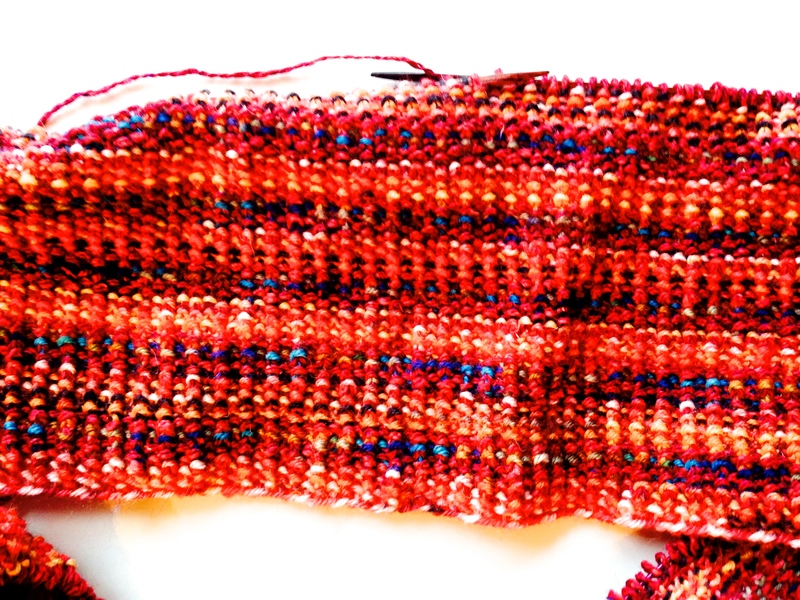 I love woven knitted stitches and have collected some different patterns over the years. I have done very little with them – must be saving it for when I retire and have lots of time. Hahahaha. This is inspiring to see. Thank you for sharing. I’m retired… 😀 And I’ve been wondering when I’ll find the time to knit a vest in this technique.